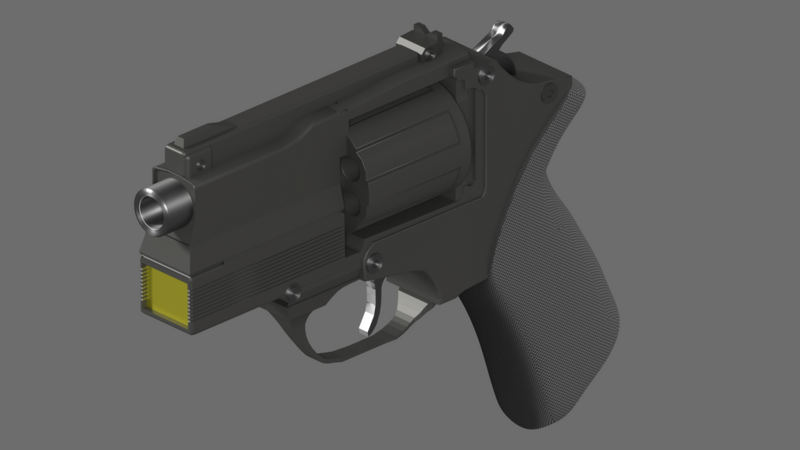 The snub pistol is a low velocity revolver designed for use on shipboard and in a zero-G environment. It fires 10mm, 7 gram bullets at velocities of 100 to 150 meters per second. No magazine is used, six individual cartridges being inserted into the revolver separately. Standard rounds include a tranquilizer round, gas round, high explosive round, and a high explosive shaped charge round to defeat personal armor. The snub pistol is a standard shipboard security weapon generally loaded with five tranq rounds and one gas round. More expensive pure combat versions of the snub pistol are available, generally in the automatic pistol configuration with extended magazines holding up to twenty rounds. Like I tend to point out, not an engineer. since it's the name implies a very short barrel. There's also a submachinegun, or more likely, an automatic pistol variant in one of the Mercenary editions, though most game mechanics tend to penalize continuous firing within the same combat round in terms of recoil, though accuracy trumps it in terms of probability of number of bullets being closely grouped enough to achieve multiple hits. 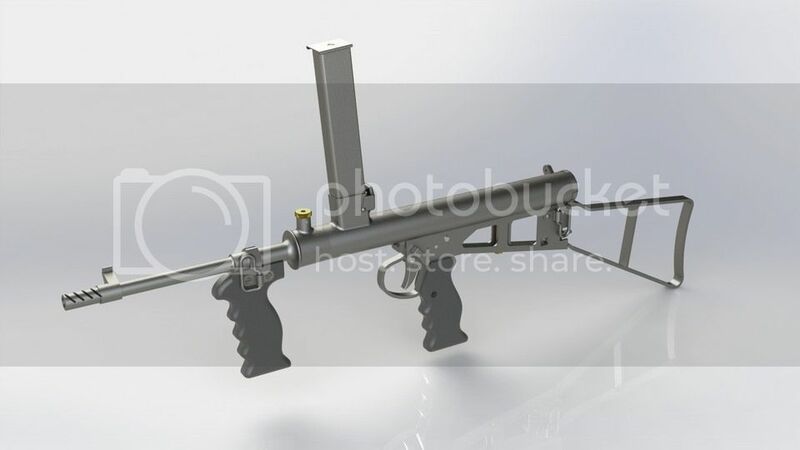 If you extend the barrel, the snub cartridge would have more time to burn the powder, or whatever propellant is being used, which should increase accuracy and range; also would apply to the pistol. Last edited by Condottiere on Thu Jan 19, 2017 4:15 am, edited 1 time in total. 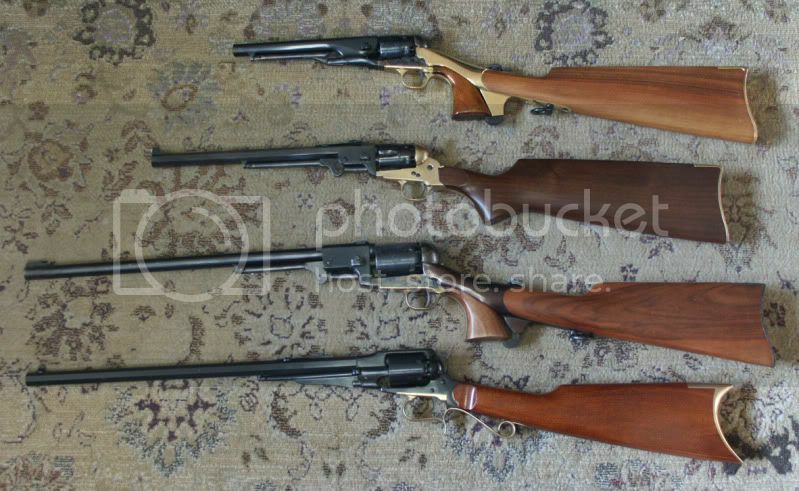 Multi-barrel multi-caliber sidearms seem to be something no one has quite mastered. There are a few that have been modestly successful. but the added complexity and somewhat limited extra utility has kept that type of firearm firmly planted in the "Oddity"
One of the traits that has kept the revolver alive as a self-defense firearm in the age of the Semi-auto is reliability. If you pull the trigger and it doesn't go bang, you just pull the trigger again. well, that and you can generally fire a magnum round out of a revolver with less trouble than firing a high powered round out of a Semi-auto. The 5-6 chamber revolver seems to be the most successful variation. since it has enough shots to deal with one or two targets and can be rapidly reloaded using Speedloaders. when you add more chambers the cylinder has to be enlarged or the walls of the cylinder have to be thinned..which has a definite impact on how powerful the round fired can be.I have had several .22 Long Rifle pistols with more than six cylinders before. they are fun little guns to shoot, the rounds ar not powerful enough to crack even a slightly thinner cylinder wall and the cylinder size isn't unmanageable. but squeezing seven. .38 Special ( around 9mm in diameter)rounds into a cylinder is a bit more tricky. Reliability within the technological level range they aren't technically obsolescent. Basically, the Snub pistol is supposed to be able to fire a more powerful round that could imitate the effect of a magnum; but the other guy should be wearing sufficient protection to mitigate that. I wonder if the rifling is to tight that friction slows down the bullet. The five chambered ones seem very streamlined, they look like Saturday Night Specials; also, they should be perfect for early caseless ammunition, since the bullets aren't directly touching each other, so that should complicate forensics. I think the alphabet agencies have decided to go back to nine millimetres, their lack of penetration in earlier incidents being an anomaly. Anyway, I was thinking a carbine with snub pistol ammunition might be a more attractive choice than rocket rounds. Condottiere wrote: . . . It fires 10mm, 7 gram bullets at velocities of 100 to 150 meters per second. No magazine is used, six individual cartridges being inserted into the revolver separately. That's not going to be a hard-hitting weapon, with about half the kinetic energy and about triple the frontalsurface area of a 22 LR round (the most-used real world round, similar to the Traveller Body Pistol round). In one of the weapon tables from classic, it says that the Snub Pistol is 10 cm long, which is really snub. 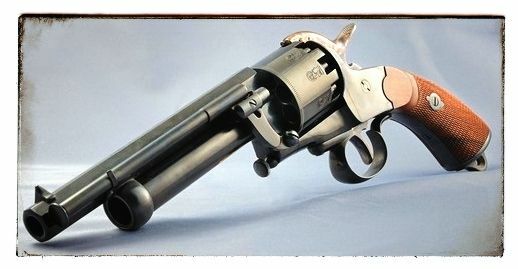 The revolver cylinder is likely to look a bit funny on such a short weapon. By simple geometry, six 10 mm cylinders fit into a 30 mm hexagon (with an seventh open space in the center), plus the cylinder walls. Although it would be about that short, it would generally resemble a more conventional revolver. The prop weapon you linked looks like a beam weapon. As I understand it, the combat Snub Pistol isn't full auto, it's a semi-automatic with a 20-round magazine. I think it would have to be a single wide magazine, because a double -wide magazine would make the grip fit poorly in human hands. That would make it 20 cm long -- twice as long as the weapon itself. Condottiere wrote: Basically, the Snub pistol is supposed to be able to fire a more powerful round that could imitate the effect of a magnum; but the other guy should be wearing sufficient protection to mitigate that. My impression is that the very low velocity of the Snub Pistol round (100 to 150 meters per second or Mach 0.3 to 0.45) is due to very low propellant charge, meant to minimize recoil. Combined with the large diameter, which means that the impact energy is spread over a larger surface area, it's not going to be a hard-hitting bullet. It might well bounce off a good leather coat, and even good blue jeans with long underwear might prevent an angled hit from doing worse than a nasty bruise. The text says that for shipboard security, the typical load is five tranquilizers and one gas round -- not ball. For the combat version, presumably used against boarding troops, I'd imagine you'd use high explosive armor piercing, or plain HE against lightly armored boarding troops -- but not ball. I would think ball rounds would be strictly for cheap target practice. With the low propellant loads of Snub ammunition, I'm not sure that would work well, though it would improve accuracy. There's also the Accelerator Rifle for when you want a low-recoil weapon for Zero G, but it uses a different round. A low penetration, not quite lethal sidearm would be a good pick for ship board security. at least for keeping troublesome passengers in line. A low velocity 10mm ball of hard rubber or polymer stings a bit...it would break skin nd leave bloody welts but not seriously injure. police use that sort of ammunition in riots and prisons fights the time. Crewmen assigned to resist a takeover by "passengers" who are up to no good. could use the weapon with btter effect....The ne'er-do-wells would not have armor or heavy weapons of their own, and a tranq round would put them down fairly handily.They could use non-lethal rubber projectiles and tear gas rounds while a second officer stands by with a lethal weapon just in case. Recoil goes directly backwards, lessening the effect, but having a lower chamber bottom barrel complicates the mechanics. Also, the cylinder gap allows the gas to escape too near your hand. On the other hand, if you seal that, you have more power to propel that slug down the barrel. If I personally wanted to fire off a shotgun shell, I'd use an actual shotgun, since pistols in combat (nowadays) are more to convince the other guy to keep his head down and his distance. To address the issue with the pistol variant and it's magazine, the ammunition supply could be staggered, like in a Glock. With zero (or no perceivable) recoil, three fast aimed shots. As regards to lethality, is there a sudden drop off in energy after five metres? You want penetration, after which the bullet could expand or break apart. It's the efficient use of the propellant, and the imperceptible recoil that seem to be important, so you can stuff as much propellant as you want, as you as the guy firing the gun can hardly feel it. The difference between firearms and jump drives, is that we actually have working examples and an idea how they should work. Thre are several Shotshell firing pistols.they work well for up close and dirty combat since a single .410 shell can put several .30caliber projectiles in the air with one trigger pull...but you can forget accuracy of any sort. Accuracy is less of an issue along a ship's corridors, and I rather doubt you have to worry about puncturing holes in the hull; sensors, switches and electronics may be another matter. We can probably rig flareguns to shoot shotgun shells. The basic mechanics are simple, you can only really improve the gun through stronger and/or lighter materials, and add-ons that absorb recoil. The ammunition should be constantly improving. A traditional snub pistol probably looks like the Walther P38Kurz, with seven bullets. Maybe the barrel is shorter. The carbine version would allow the powder to burn slower and longer, and the heavier furniture would absorb more recoil. The top mounted magazine allows gravity to assist the spring in pushing the bullets down to the breech, which increases reliability, or a highly reliable weapon, maybe an early Kalshnikov in that regard. It's unusual, and not upto the performance you'd expect from a Heckler & Koch, or a carbine version of an assault rifle. Of course, in a zero gee or low gravity environment, this form of ammunition feeding may be less useful. I like the Sten design, but apparently a lot of people liked to grab the magazine as a grip, which could put it out of alignment. Not unless you have a weak spring. But it could be a weapon design feature. The Bren gun used the feature to make it easier to reload in the prone position. The BAR was a bit of a pain to reload while the shooter was laying prone.It did make the sighting system a bit trickier but the BREN was arguably the best squad automatic weapons of the era. Our primary job is to make Travelling sneakier and hard hitting. Condottiere wrote: Our primary job is to make Travelling sneakier and hard hitting. 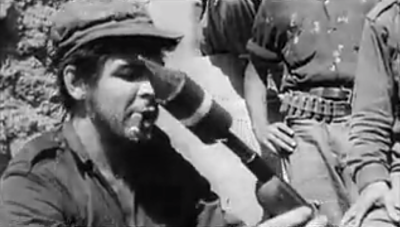 One example is described by Che Guevara in his book Guerrilla Warfare. Called the “M-16”, it consists of a 16 gauge sawed-off shotgun provided with a bipod to hold the barrel at a 45-degree angle. This was loaded with a blank cartridge formed by removing the shot from a standard shotshell, followed by a wooden rod with a Molotov cocktail attached to the front. This formed an improvised mortar capable of firing the incendiary device accurately out to a range of 100 meters. The PIAT is described as a spigot mortar. Condottiere wrote: One example is described by Che Guevara in his book Guerrilla Warfare. Called the “M-16”, it consists of a 16 gauge sawed-off shotgun provided with a bipod to hold the barrel at a 45-degree angle. This was loaded with a blank cartridge formed by removing the shot from a standard shotshell, followed by a wooden rod with a Molotov cocktail attached to the front. This formed an improvised mortar capable of firing the incendiary device accurately out to a range of 100 meters. The Piat was a bit of a tricky piece of work. The tail of the projectile slid down a rod with the tail containing the pressure of the propelling charge. the rod slammed forward and combined with the power of the small charge sent the projectile flying...hopefully, the powder charge also reset the driving rod at the same time. Horseshoe magazine, fifty rounds, so I suppose forty ten millimetre ones. Machine pistol, so I suppose the snub pistol could be modified for automatic fire. Lack of recoil would make that ideal.